It's not clear if Alexander found the bone while plowing a field or while digging a channel to divert a channel of the river. Either way, it would have been a lot of work to get it lifted out of the ground and it sure would have been a shocking discovery! What do you think he would have thought he had found? This was several years before the word "dinosaur" was even published. Did he think this bone was of a Giant that used to live in Cape Breton? "November 2nd (1836). Lecture. John Young, Esqr. Lectured on the Advantages and Pleasures of Science. The following Presents were exhibited to the Institute, a bone of a Mammoth found in Cape Breton, presented by - "
Based on modern science and comparative anatomy, we now know that the bone is from a Mastodon and not a Mammoth. Dr. J.W. Dawson was the first to study the Mastodon bone and mentioned it in the first edition of Acadian Geology (1855). Dawson then published the earliest illustration we have of the bone in the second edition of Acadian Geology in 1868 (Read on Archive.org) . The early illustration shows a fragment of femur flaring from the middle of the bone. This fragment is no longer attached but is still with the specimen. The femur was cared for by the Halifax Mechanics' Institute until it closed in 1860. The specimens and models that were in the Institute's collection were transfered to the new Provincal Museum of Nova Scotia (now the Nova Scotia Museum) when it was formed in 1868. The femur has been part of Nova Scotia Museum since it started 150 years ago, and has been part of Nova Scotia science culture and history for over 180 years! 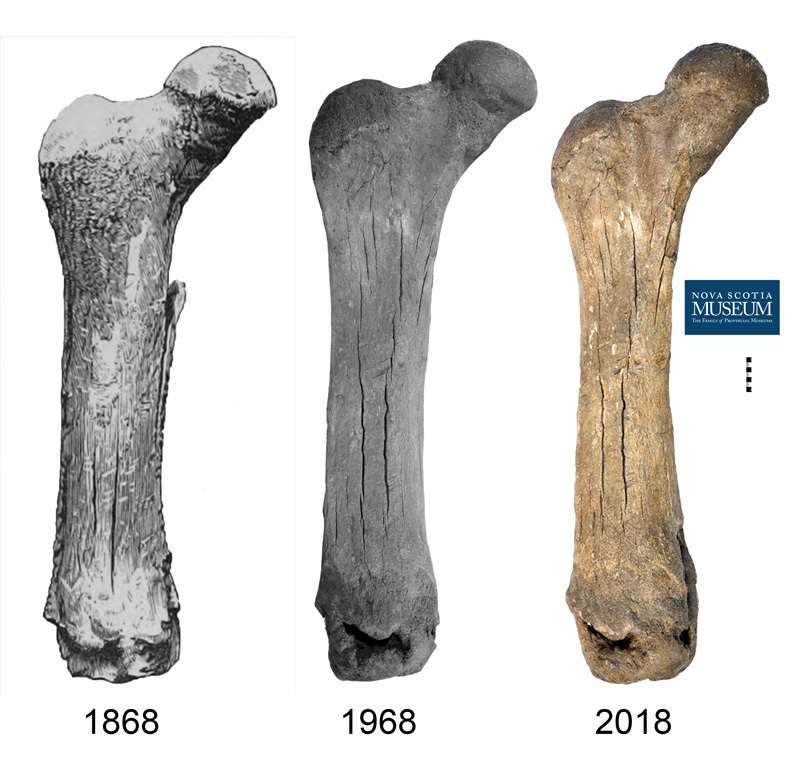 In 1968, the femur was sent to Ottawa for radiocarbon dating. The results suggest the bone is around 75,000 years old (Harrington 1993). This would suggest the animal lived before the last glacial event that covered Nova Scotia in a thick layer of ice. The ice finally melted about 15,000 years ago and the ancient waited along the banks of the Middle River until it was found by a Alexander McRae. 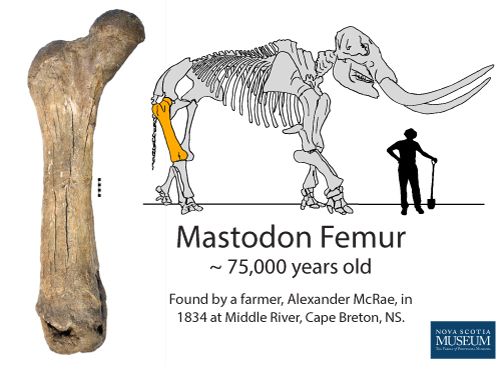 The Big Sandy femur is just one of several Mastodon skeletons and teeth that have been found in Nova Scotia. Other Mastodon bones have been found in gyspum quarries and gravel depoists across the province. You can see some of these on display now at the Museum of Natural History, and a tooth that is on display at the Fundy Geological Museum in Parrsboro. We will be sharing information about these other specimens in the future. There are likely to be more Mastodons found in the future. Remember, all fossils are protected in Nova Scotia by the Special Places Protection Act. Fossils are part of our collective, shared heritage, and have contributed to important scientific discoveries for over 150 years! If you find a bone or tooth that you think is a bone of Mastodon, or anything you suspect is a fossil, please contact the Museum.